Milon in Washington DC: Today, we have celebrated The Free Press. Today, we have celebrated The Free Press. 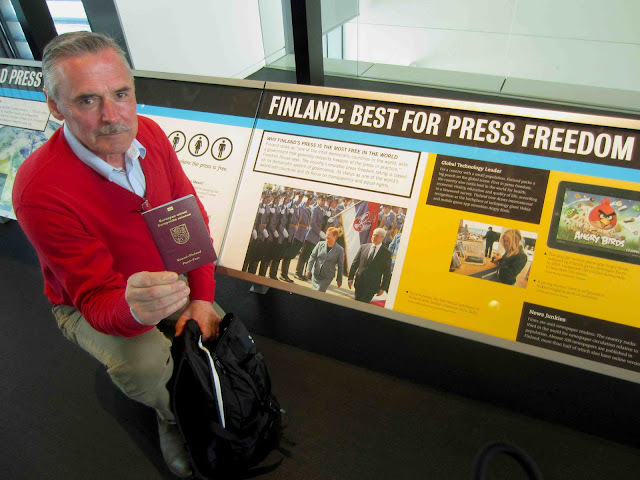 "Did you know that Finland is considered the country with the best press freedom in the world?" I asked my dad, who is a Finnish citizen, in spite of his almost 40 years living in Sweden. He did not quite believe me, so I took him to the Newseum. He was happy to find out that I was right, and proudly took out his passport to show me – and the rest of the museum visitors – his true origins. Go Finland! We should all learn from you. I just started thinking about this story, since May 3 is World Press Freedom day. Definitely a day worth celebrating. For about a year we have been reading about two swedes in eitopian jail. Some time ago I read that the money supporting the swedes had run out. When reading that it looked like most of the money was used in Sweden in order to rouse the public opinion in favour of these journalists and their aim. I wonder how much funds were raised and how much was used to support the journalists only? Unfortunately, I don't know more than you do about that. But I agree, it's an interesting question.